The beginnings of the Château de Vault de Lugny date to 1120 when it was built by Jocelyn d’Arey, a knight of the Duke of Burgundy and veteran of the Crusades. When his daughter married Guy II de Toncy, her husband became the new lord of the castle. The property was rebuilt in the 15th and 17th centuries. In 1986 it opened its doors as a luxury hotel. The atmosphere here is one of relaxation and refinement. 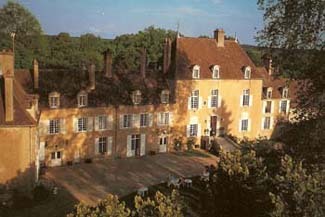 If you have to pick one castle hotel to splurge on in Burgundy, this is the place. If you have small children in tow be aware that the hotel is filled with antiques. The hotel and restaurant are closed on Thursdays except for July, August, and holidays. Vault de Lugny is about 15 km. from Vézelay. From A6, exit Avallon. Take D957 toward Vézelay. At Pontaubert, take D142, which is the first road on the right after the village church. By public transportation: Paris by TGV to Montbard, and from there by bus to Avallon. On site: trout fishing; tennis; swimming pool. Nearby: hot-air ballooning; spa; hiking; horseback riding; rafting; canoeing; climbing; wine tasting. There’s no better entrance to your château for the night than crossing a water-filled moat. After you pass through an enormous gate, you’ll then sweep up a circular drive to be met with a glass of champagne. This stunning five-star property is the place to come for a honeymoon or romantic weekend. Several types of rooms and suites are on offer, including a separate cottage with its own private garden. Each room is individually decorated with the larger ones being the most popular. The Le Prince and Le Roy rooms have sumptuous four-poster beds, with the latter boasting a marble fireplace and original paneling and flooring. This is the best room in the château. Other rooms have fireplaces as well, antique furnishings, and luxurious fabrics. The en suite and modern bathrooms are immense. The less expensive rooms may not have the huge bathrooms, but they are charmingly decorated and are of good value. The top-rated cuisine is served in the château’s former kitchens that feature a massive fireplace and a Gothic vaulted ceiling. Produce comes from the château’s own gardens. An English-style bar is the perfect place for before or after dinner drinks. To help walk off that meal, take a stroll through the beautiful gardens, woodland, and pastures amid peacocks, geese, and hens.